It’s the first song from the Congolese-Belgian rapper’s upcoming EP, 64 Bits & Malachite. 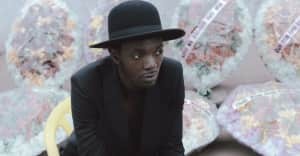 On his new single "Capture," Congolese-Belgian rapper Baloji's talks of the Congolese people's fight for peace in the wake of years of civil war that has plagued DR Congo. Ode to the struggle to resilience/ The goal: black excellence, he raps in French (these English translations are pulled from the striking video below). The track also features vocals from rising Cape Town artist Petite Noir and Kinshasa singer Muanza, and production from Metronomy’s Olugbenga Adelekan. Baloji's candid lyrics and aggressive tone paired with his collaborators' soothing vocals create an empowering anthem. “I met Olu through Twitter about three years ago and we stayed in good touch," Baloji explained in an email to The FADER. "Last year we finally met at a Fela tribute show in London we were both performing in. The collaboration started from him first making this beat as a remix to one of my other songs. I loved it so much that I decided to make a new song out of it." "It felt extremely visual," he continued, "and gave me this direct image of a meteor avalanche and stones colliding. At this time, I was just back from a tour in DRC and I was still in shock of the [Congolese region] Kivu part of the experience: the beauty of this land, the three morning sold-out shows we did in one day before the 4pm curfew time there, the fantastic mountains, the volcanic soil and its residue on the tarmac, and, of course, the unexplainable fire that you can see on every face. I asked [Petite Noir] to work on chorus to match this idea, and also religious singer [Muanza] to reflect on the Congolese quest for better days." Universal France will release 64 Bits & Malachite in October.